There are a lot of us looking up lately. The blood moon lunar eclipse of a few days ago had many eyes trained to the skies and people talking about the stars and planets and the cosmos. Another astrological event is coming up that is creating a lot of talk. 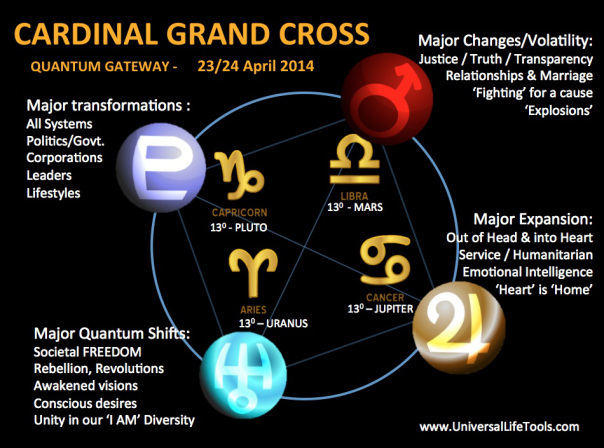 Its called the Cardinal Grand Cross and it will occur April 23-24, 2014. We in Dolores Cannon’s Quantum Healing Hypnosis Community are talking about it too. The following information about the event is from a QHHT session facilitated by Dedicated Practitioner Cynthea Cameron of Tucson, Arizona. I have been hearing a lot of buzz recently about the upcoming April astrological event of the Cardinal Grand Cross. I had a session today where the client expressed an interest too. Before starting my client asked me to leave the door open to facilitate just a little airflow into the room, so throughout the session we could hear a gentle breeze blowing outside. At the beginning of the session this client had a lot of resistance, but finally he allowed the session to flow. “There are waves of energy of love, of intelligent life, bathing your planet now. And this could be a day at which all of you who will allow it connect with it in a much more fully and deep way. And as that occurs and you let it rest inside of you, we will be closer to you, and you will be closer to us. And those who have not seen before may begin to see. And those who have not heard before may begin to hear. And those who have shut off feelings may begin to feel again. This is the bringing together of the world. And then you become more and more multi-dimensional. And your crystal form begins to take shape. And we join and we unite. But this is a process. It doesn’t come automatically, or in an instant. It comes wave by wave – shower by shower – droplet by droplet. And know that it is coming. Know that you are being uplifted. You are uplifted in a sense that you are being united with us. But it doesn’t mean that you never had that capacity. For you always have. And it is a rare and wonderful beginning. The following is an excellent blog and article from Universal Life Tools about just that event if you are unaware or unclear about the potential consequences of the energy alignment that is about to occur. Those who come for Quantum Healing Hypnosis sessions usually are seeking personal healing or information, but very often, this type of higher level or universal or cosmic information and understanding is also available. You too can learn QHHT–online classes now available! This entry was posted in astrology, Candace Craw-Goldman, Dolores Cannon, Events, Quantum Healing Hypnosis Technique, Uncategorized and tagged astrology, Candace Craw-Goldman, cardinal grand cross, Dolores Cannon, QHHT. Bookmark the permalink. F: http://www.facebook.com/BiosilSA – Like our Facebook page, we would really like that! Pingback: Kardynalny Wielki Krzyż : Perspektywa QHHT | "Zmieniając siebie zmieniamy Świat"